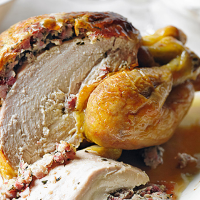 This roast chicken with bacon and herb stuffing makes the ideal centrepiece for Sunday lunch, plus the leftovers are great sandwich filling. Preheat the oven to 200 ̊C, gas mark 6. 1. In a bowl, mix about two-thirds of the softened butter with the garlic, breadcrumbs, lardons and parsley and season. 2. Remove the string from the chicken and place the bird into a large roasting tin. Using your hand, carefully loosen the skin over each breast to make a pocket then push this mixture under the skin of the chicken to fill the pockets. See Cook’s Tip. well, inside and out. Push the lemon halves into the cavity. Cover with the foil and roast for about 1 hr 50 minutes (45 minutes per kg, plus an extra 20 minutes), removing the foil for the final hour of cooking. 4. When the chicken is cooked, the juices run clear when pierced by a skewer, and there is no more pink meat, place onto a board. Re-cover with foil and leave to rest for 10-15 minutes before carving. Serve with the cooking juices spooned over and salad. Pre-filling a sink with hot, soapy water means you can wash your hands after handling the chicken without touching taps or anything in the kitchen first.